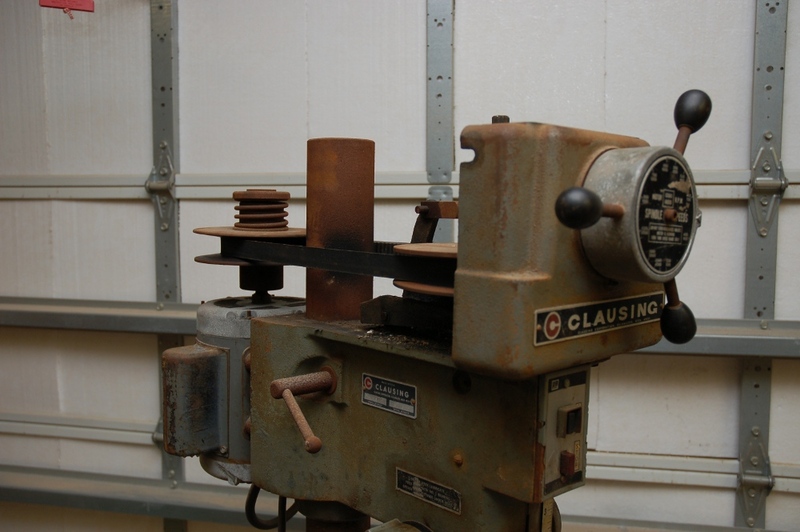 In the summer of 2010 I was looking for a drill press and was thrilled when I saw a Clausing 15″ variable speed drill press on Craigslist. When I went to pick it up I looked it over and started it up. It seemed fine except for some bad paint which is expected from a ~35 year old machine. 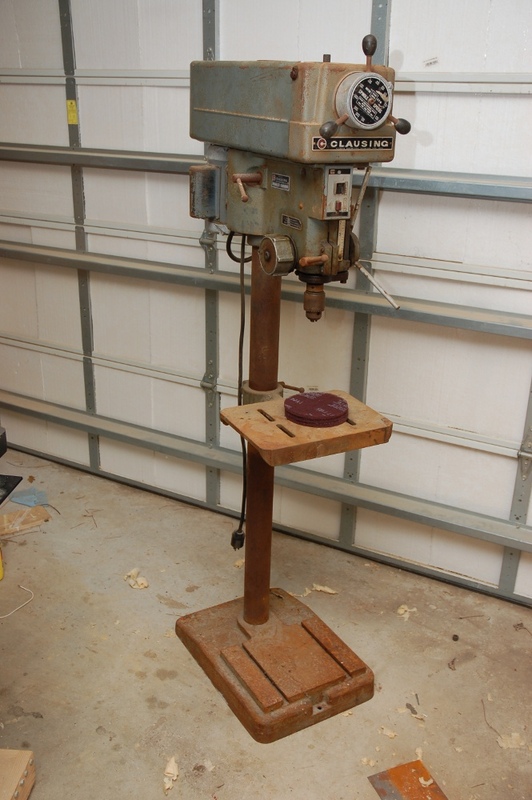 I got it home, drilled a couple holes and noticed some tapping from the back of the drill press near the top. Hmm… A couple of days later I noticed that there was some runout (lateral play) in the drill bit. Strange noises and a lot of movement at the drill bit are not something you want in a drill press. If you take the belt shield off you can see the Reeves pulley system that makes this drill press variable speed. You crank the big knob on the front and it moves one half of the front pulley up or down changing the ratio between the pulleys. This changes the speed of the drill bit. 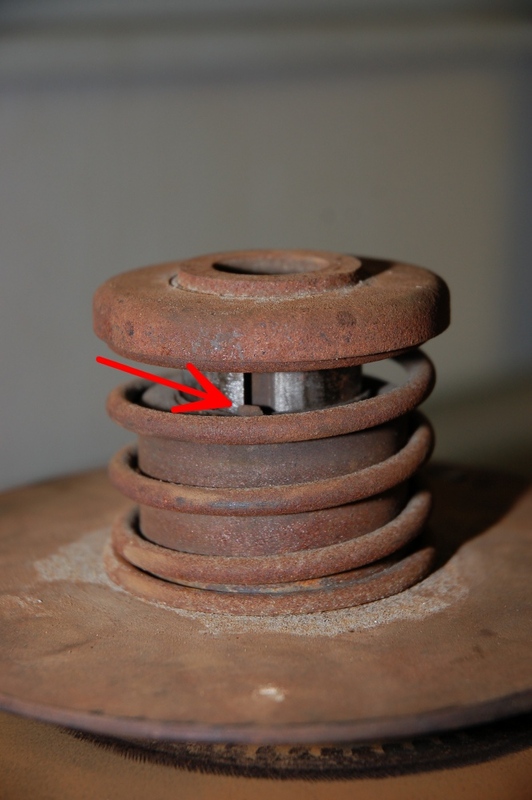 The back pulley is spring loaded to counteract the movement of the front pulley and maintain belt tension. After a little bit of inspection I tracked the tapping noise to the back pulley assembly. Here’s a closeup of the top of the back pulley. The red arrow is pointing toward the key which should be nicely centered in the slot but is not. Part of the key was missing and allowing the top pulley half to move around making the tapping noise. A broke key is no problem though as they can be replaced cheaply. Unfortunately, it was a little more than a broke key. At some point the key sheared but it appears no one took the time to fix it. 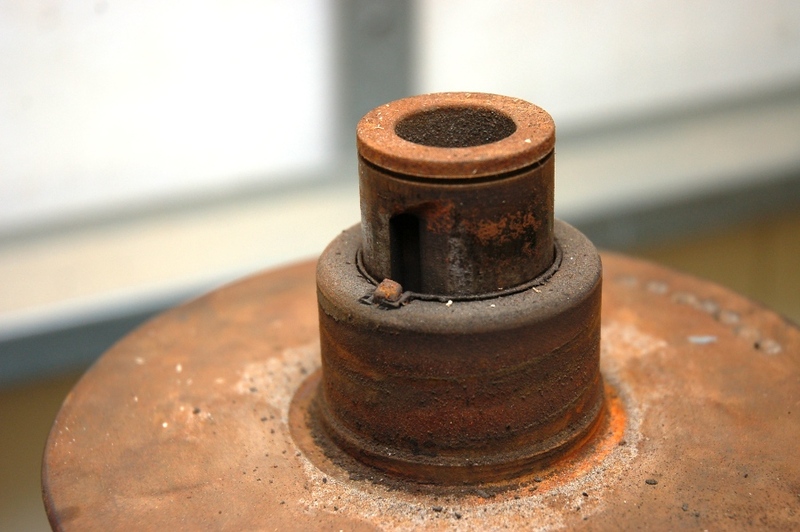 Over time, the key way in the cylinder that the top pulley half rides on had one of the sides worn away. Not good and it means I have to replace this part. Next, I looked into the runout of the drill bit. I noticed I could grab the chuck and move it around side to side indicating that it wasn’t the chuck. That narrowed it down to a bearing or the spindle. The spindle is a long shaft that runs from the front pulley down to the chuck. I removed the spindle and bearing to see what was wrong. I discovered that the bearing had worn out resulting in it not spinning freely. The result of this was it wearing away the spindle and it no longer contacting the bearing. Not good…I have to replace this part as well. 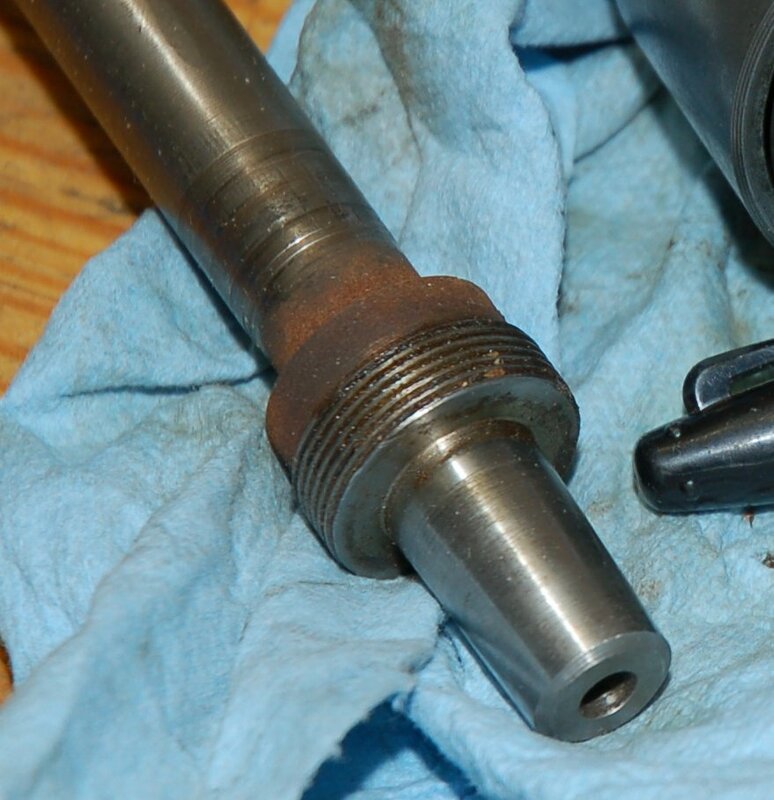 You can see the worn section in the picture below above the threaded section. One of the nice things about Clausing is that they’re still around. Since they make industrial machines they still manufacture and sell replacement parts. This is good because it means I’m not left with a worthless machine. So, I inquired about replacement parts and found out that they’re available but expensive. That has been a show stopper for a while but I finally decided I was going to get it fixed this fall. So, I’ve started working on it again and intend to post my progress but felt a little background post would be beneficial. Thanks for the comments. I did manage to get it back together and it works wonderfully. I have two other posts about the Clausing which cover fixing it back up. No. Drill press rpm is controlled by the wheel on the front of the drill press.